For some people a film or book is merely an enjoyable experience, but for others it can be a way of life. What makes fans so passionate about their entertainment? What drives them to find other fans that share their fervor both online and at conventions? Check out these documentaries featuring fandoms. A film by Morgan Spurlock that follows the lives of five attendees of the San Diego Comic-Con. 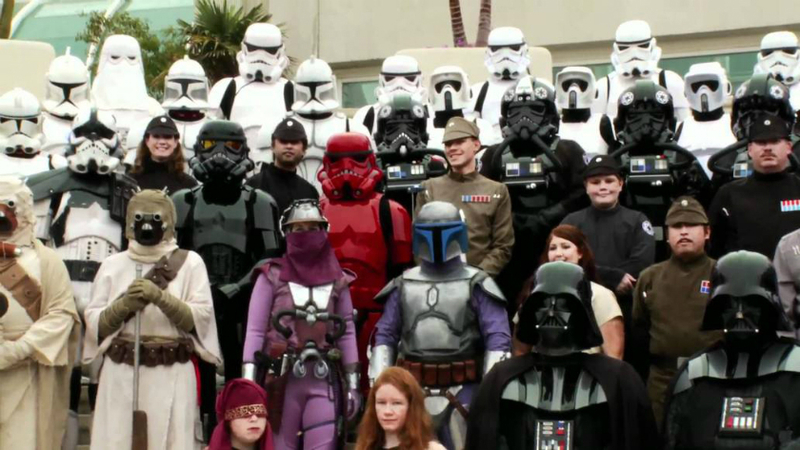 The film includes one on one interviews with Comic-Con veterans along with up close and up front coverage of all the panels, parades, photos, costumes, crowds and camaraderie that make up one of the largest fan gatherings in the U.S.
A film about the world’s most dedicated “Star Wars” fans. From lightsaber wielding martial arts academies to a filmmaker who built the world’s only life-size Millennium Falcon, the film offers viewers a rare glimpse into rabid fans’ personal and professional self expression that borders on obsession. This documentary explores the extreme side of the “Ghostbusters” fandom, and looks back at the impact the franchise has had on the world over the past three decades. Through interviews with key cast and crew, the film presents stories of fans who indulge their passion by gearing up, congregating at conventions and even doing charity work. Spanning over two years of filming, this documentary is a cinematic monument to the immensity of the “Back To The Future” trilogy’s fandom. By capturing countless of hours of footage and interviews, the documentary crew found that simply by delving into the impact of the trilogy an epic journey began to unfold before them.